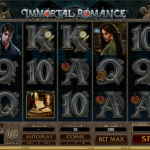 Immortal Romance is an epic video slot game from Microgaming. 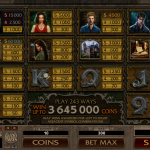 We have a vampire themed slot with gothic atmosphere and powerful sound effects. As you play the game the story unveils and we find out that this is actually a love story about people who are madly in love with each other but for some reason cannot be together. 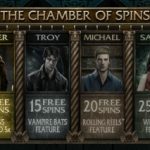 Back when this game was launched the vampire theme was trending and we did not expect this slot to last, but it turns out that Immortal Romance is one heck of a slot that will be played in the years to come. Immortal Romance is a high variance slot and the special feature department is where we can see its true colors. We have 2 special symbols, the game’s logo is the wild and the lion’s head door knocker is the scatter. The main bonus is The Chamber of Spins where you can pick one of four main characters. The first time you trigger the feature you can only pick Amber which offers 10 free spins with x 5 multiplier. After you trigger the feature 5, 10 and 15 times you will unlock all the characters respectively and this is where the fun begins. There is also a random feature Wild Desire where up to 5 reels can turn completely wild. Immortal Romance is a true masterpiece from Microgaming. The game play is so powerful and fast paced and you will love every second of it. There is a great chance to win big, but this is a high variance slot so you should be careful while you are playing it. It is so easy to get carried away when you have a game of this caliber in front of you. For a super funny slots game you should consider playing Karate Pig a 5 reel slot by MicroGaming.